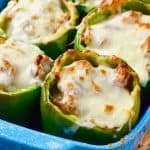 These Italian Stuffed Peppers are a perfect easy weeknight meal! A full, well rounded meal, all in one dish! This Italian Stuffed Peppers Recipe is a family favorite in our house. Cut the tops off of the peppers, removed the ribs and seeds, and then dice the tops of the peppers. Heat a large skillet over medium heat, add olive oil. Add the chopped bell peppers, and saute until soft, about five minutes. Add the Italian Seasoned Ground Turkey, and break up as you cook it. Season with garlic powder, onion powder, dried parsley, and dried basil. Cook until the meat is no longer pink. Remove the skillet from heat. Stir in the cooked rice, pasta sauce, and one cup of the mozzarella cheese. Divide the mixture between the five hollowed out bell peppers. Top with the remaining cheese. Bake uncovered for 25 minutes. Serve immediately.